There I was in the green room, about to play at the Gilmore Festival. Included on the program was Chopin’s Polonaise-fantaisie — music I’ve performed, coveted, engaged with, grappled with for 30 years. Over time, I’ve exorcised, from my playing of the piece, the details and atmosphere of Vladimir Horowitz’ 1966 recording. (The sounds that were my first contact with this music.) Lately, I’ve been trying to construe the Polonaise-fantaisie’s admittedly detailed script as the traces of a fantasized, or fictionalized, extemporaneous musical action! Instead of the practiced brilliance of certainty, I’d welcome the wonder of not knowing so exactly what’s coming next. Do modern classical performers spend too much effort trying to play with surface perfection? I’m not sure what playing “perfectly” would be exactly. It’s true that a lot of work can go into getting all the notes in the “right” places. How important this is and how obsessive we become about it varies. Certainly there is perfect playing that seems far from ideal music-making. And there are vivid, lively performances in which missed notes don’t seem to matter. It crossed my mind in the green room that if I delivered a “note-perfect” performance of the Polonaise-fantaisie, I would die! And soon. Would it be daring the gods? (Surely accidents are so frequent in playing scripted music that we don’t have to fear not-making mistakes?) Would it be that in the exact realization of the script (whatever “exact” really is, and to what level of scrutiny?) the “life” would be drained away, leaving the music and me — in my moment of mystical thinking — dead? Although perhaps not directly related to his playing, the pianist Simon Barere did collapse and die at Carnegie Hall, in the midst of a performance of Edvard Grieg’s Piano Concerto. (Isn’t there a Neil Simon character who prays not to die — on Third Avenue?) Perhaps expiration while playing Brahms at the Musikverein would be preferred? During my actual performing in Michigan, I forgot about my dare to the devil. A couple of days later, I recalled an audible wrong note in the performance. In a place where a quiet low bass E appears in the notation, I also depressed the adjacent E sharp. That little mistake may keep me humble. Anyway it’s keeping me alive. Thanks, Bruce, for the thoughtful post. Your term ‘surface perfection’ seems apt. We’ve all sat through those superficial performances that resemble typing more than music making. As I see it, technical precision and artistic expression are often considered as separate entities. But we can achieve both simultaneously and even employ one to feed the other. As a performance educator, I’ve observed that when students view technical execution as distinct from soulful expression, they set up a dualistic battle that blocks any deep engagement with a composition and feeds their performance anxiety. In truth, we perform with our whole selves. So music educators must guide students to emote and control harmoniously. Which I have to say might be even worse. If anyone leaves a comment with advice on how not to bump into neighboring semitones also leave your home address so I can come slap you. To paraphrase Beethoven on his own music – it was more important that the spirit of the notes be heard – technical perfection wasn’t a primary concern. 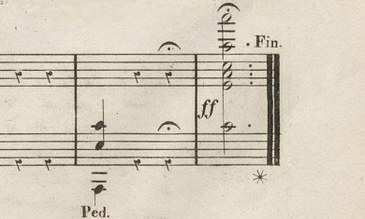 Recordings have weaned us towards the technically perfect – punch in the right note here, the better phrase here. Think Gould, whose work is practically manufactured for the recording. On the other hand, do I want to hear a whole evening of spirited performances of Beethoven where “wrong notes” are in plentiful supply? Probably not. I always hope that my music is performed with a sense of hearing it composed in situ – spinning from my notation through the performer (bless them each and every one) to the listener. A good performance is not always spot on pitch perfect. This is one aspect of the joy of live performance. Music is hard work and I want to appreciate it the way any hard work wants to be appreciated. I don’t have anything to add, but I love this post. See Darren Aronofsky’s film “Black Swan.” Perfection = Death.